Summer is coming, which means lots of grilling, picnics and barbeques. If you’re like me, you’re looking for something that’s tasty and easy to make to bring to the next gathering. Look no farther! This pasta salad is just for you. Just try it. You won’t be disappointed! 1. Make pasta according to package instructions. Drain and cool. 2. In the meantime, chop vegetables and slice olives in half. 3. In a large bowl, mix all ingredients together. Keep refrigerated until serving. (I like to add dressing before serving, otherwise the pasta just soaks it up and you’ll have to add more). 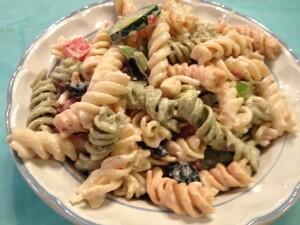 This entry was posted in Recipes and tagged barbeques, creamy italian dressing, italian pasta salad, picnics. Bookmark the permalink.